Summer showed up and it's been non-stop for months. It's been hard to find the time to edit and post but I'm sure everything will settle down eventually. Back to our east coast trip and a beautiful evening hike in the Tablelands. The landscape here is otherworldly. It would seem more at home in the desert landscapes of the American southwest than in Newfoundland. To hike in the Tablelands is to walk on the mantle of the earth, which is normally far below the earth's crust. Peridotite was forced to the surface during a plate collision several hundred million years ago. The rusty colour indicates high levels of iron. Highly toxic minerals and a lack of nutrients results in little plant growth - thus the barren landscape. Our hike was the perfect end to a stressful day. It was a warm evening and we had the trail to ourselves. Three girls in a vast, quiet landscape. Storm clouds hung low over Gros Morne National Park on the first few days of our visit. The tent walls would flex and bend in the strong winds, delivering stinging slaps to the face in the middle of the night. Clearly our choice of tent was excellent, though. It bore up well under harsh conditions - no broken poles and a warm, dry interior. After enjoying some moose burgers in town, we drove around the park and watched an incredible sunset. The following day the others hiked to the top of Gros Morne mountain (post to come later) while I took the opportunity to visit some of the local sites and get a bit of work done. The day was dark and the seas were rough but the light was phenomenal. Stray beams of sunshine put a spotlight on the earth and the Tablelands seemed to glow in an almost ethereal light. A slice of cheesecake topped with cloudberries in a local restaurant tasted sublime after many hours exploring the Lobster Head Cove Lighthouse. 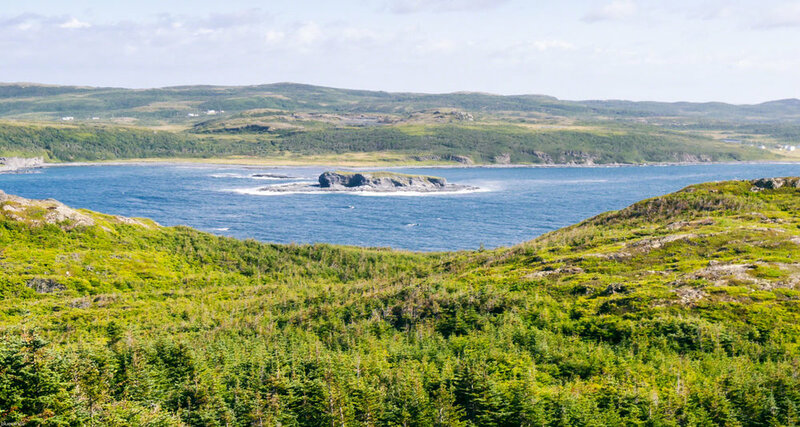 The drive from Newfoundland's northernmost tip along the western coast to Gros Morne National Park is gorgeous. Dotted with fishing villages, lighthouses and hiking trails, we dawdled our way down, enjoying the peace and beauty of the region.